A full slate of college basketball means plenty of betting action to highlight. Here's a recap from across the country. A full slate of college basketball means plenty of action to highlight. Here is a betting recap from across the country on Saturday. ## Illini pick up big conference win The Illinois Fighting Illini are in the middle of what's been a disappointing season, but Brad Underwood's team picked up its signature win of the season in upset fashion, [beating No. 13 Maryland 78-67](http://www.espn.com/mens-college-basketball/game?gameId=401082350) at Madison Square Garden. The Illini (6-14, 2-7 Big Ten, 8-12 ATS), who closed as 8.5-point underdogs, earned their first win over a ranked opponent since beating Iowa in the 2016 Big Ten tournament. The win was the largest upset of the day thus far. It was a tough beat for UNDER bettors, who had to watch a free throw contest break out in the final minute. The teams combined to go 12-for-12 from the line in the final 58 seconds, and two of those came following Maryland head coach Mark Turgeon's technical foul. There were 18 points scored in the final 1:19. The total closed at 144.5. Illinois freshman Ayo Dosunmu scored a game-high 20 points, but it was the bench that gave the Illini a big lift, as Tevian Jones scored 18 off the bench and Andres Feliz added 15. The Terps dropped to 16-5, 7-3 in the Big Ten and 10-10-1 ATS. <a href="https://www.youtube.com/watch?v=wQv2ug4CogM" class="embedly-card" data-card-width="100%" data-card-controls="0">Embedded content: https://www.youtube.com/watch?v=wQv2ug4CogM</a> Elsewhere in the Big Ten, Ohio State earned a 70-60 win at Nebraska as a 7-point underdog, but Wisconsin took care of business against visiting Northwestern, 62-46, laying 8.5 points. __$10,000 contest:__ [Free to enter](https://betchicago.chalkline.com/games/10k-big-game-blitz) ## Duke fails to cover against Georgia Tech The No. 2 Blue Devils (17-2, 6-1 ACC, 11-8 ATS) got point guard Tre Jones back after the freshman missed the last two games with a right shoulder injury. He only had six points, but R.J. Barrett had 24 points and 11 rebounds, and Zion Williamson scored 22 in a 66-53 win. But Georgia Tech (11-9, 3-4, 14-6) easily covered the 23-point spread, and Duke has lost four of its last five against the number. Elsewhere in the ACC, No. 2 Virginia, which is the best team in the country ATS at 16-3, cruised at Notre Dame, 82-55, as a 12-point favorite. No. 21 NC State beat visiting Clemson 69-67, but failed to cover a 5-point spead, and No. 23 Louisville won at home over Pittsburgh, 66-51, laying 10.5. ## Howard keeps rolling for Marquette Marquette junior guard Markus Howard, the [seventh-leading scorer in the country](http://www.espn.com/mens-college-basketball/statistics/player/_/stat/scoring-per-game/year/2019/seasontype/2/group/50) entering the day (24.3 points per game), scored 31 points in the No. 12 Golden Eagles' 87-82 win at Xavier as 2.5-point favorites. It was the only Big East game on the Saturday docket. Howard has five 30-point games this season and Marquette (18-3, 7-1 Big East, 13-7 ATS) is 5-0 ATS in those games. ## Nation's top ATS team loses big In the only early game between ranked opponents, No. 24 Iowa State (15-5, 12-6-2 ATS) went down to Ole Miss and beat the 20th-ranked Rebels (14-5, 15-4), 87-73, as 1.5-point favorites. Ole Miss has failed to cover three of its last four after 10 straight covers. The Rebels entered the game 15-3 ATS. __MORE:__ [College hoops bad beat from earlier this week](https://www.betchicago.com/college-basketball-bad-beat-georgia-lsu) ## Kentucky pulls away late against Kansas The day's premier matchup delivered as Kentucky and Kansas played a close game throughout before the Wildcats pulled away late for the win and cover, 71-63. 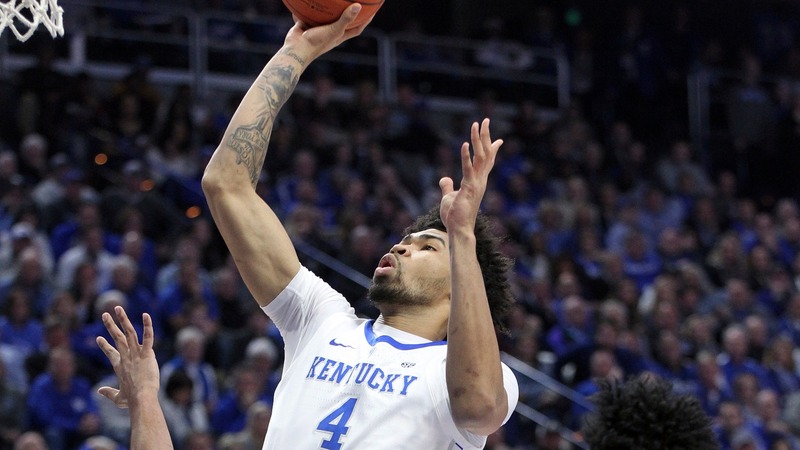 Kentucky closed as a 5.5-point favorite with the total of 144.5 easily cashing UNDER. Kansas held a three-point lead at half, 33-30, as Kentucky failed to make a shot from beyond the arc. John Calipari's team hit four three-pointers in the second half. Reid Travis was a force down low with 18 points, trailing teammate P.J. Washington in scoring with 20. Kentucky's size wore down Kansas inside with 17 offensive rebounds (Kansas had 9) and a 50-36 advantage on the glass for the game. ## LSU covers in miraculous fashion Missouri, getting 5.5 points, was leading by 14 with 2:14 left against LSU and somehow the game went to overtime. Somehow LSU covered. LSU used three three-pointers, a layup and four free throws to force overtime, tying the game at 71 with two seconds left in the game. It got worse. LSU led 83-78 with 19 seconds left. Mizzou answered with a Jeremiah Tilmon layup with 9 seconds left to make it an 83-80. A quick foul sent LSU's Skylar Mays to the line for two made free throws and an 85-80 lead. Mizzou's Jordan Geist missed a three with roughly three seconds left and was rebounded by LSU's Tremont Waters. Missouri fouled Waters with 0.9 seconds left. He made one of two free throws for the 86-80 final and cover. Take the week off, Mizzou bettors.